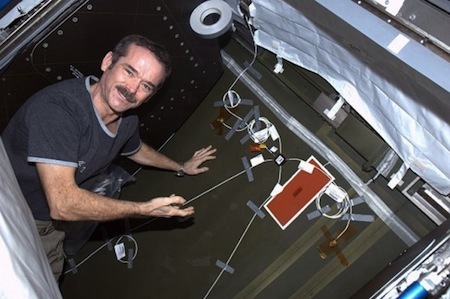 By observing the high-frequency noise levels generated by hardware and equipment operating in the Destiny laboratory and Tranquility module aboard the space station, Madaras and his team are helping to develop an automated system that would locate air leaks in a space structure's pressure wall -- the outside part of the orbiting laboratory that keeps in oxygen. "If a leak does occur, it's one of those things where you may not have a lot of time," Madaras said. "These guys can always go sit in the Soyuz capsule and close the door and go home. They've got that capability. But no one wants to just abandon ship, so there's always this desire to deal with it." But dealing with a leak means identifying the source. Right now, that would require someone to listen for the signature hiss of escaping air -- not an easy or quick task, especially on a noisy space station that has structures covering the wall where the leak might originate. That's why, as part of UBNT, astronauts are in the process of installing several distributed impact detection system (DIDS) units on the pressure walls of the space station. DIDS units are high-speed, four-channel digitizers that record ultrasonic noises. Instead of listening for the hiss of air, these units detect the high-frequency sounds moving through the metal itself. Each unit has four pressure-sensitive transducers, which Madaras compares to the pickup coils on an electric guitar. If all goes according to plan, and Madaras and his UBNT team are able to identify and characterize the day-to-day background noises on the orbiting outpost, they then will be able to develop a system that can pick out leak-generated noises from the clutter. Science fiction Grandmaster Robert Heinlein thought about this problem. In his 1948 short story Gentlemen, Be Seated, he described life in a lunar habitat. And the inevitable air leaks. There were perhaps a dozen bladder-like objects in the tunnel, the size and shape of toy balloons. They seemed to displace exactly their own weight of air; they floated without displaying much tendency to rise or settle. Konski batted one out of his way and answered me before I could ask. "This piece of tunnel was pressurized today," he told me. "These tag-alongs search out stray leaks. They're sticky inside. They get sucked up against a leak, break, and the goo gets sucked in, freezes and seals the leak." From NASA via Gizmag; thanks to an anonymous reader for contributing this story. Update: I should also point out that this reminded my anonymous contributor of an Original Star Trek episode ("Court Marital") where Kirk has the computer filter out all the sounds on the Enterprise until he can hear the heartbeat of the person he is looking for. Me too - I remember that episode as well. End update.